The Keeroo is a convenient, effective and multifunctional hand grader for many applications. The Keeroo can be deployed in the construction of gardens and maintenance. With this device you level the sand bed, which serves as the base for planting, fast, smooth and tight. The Keeroo also effortlessly evens the subsoil for pavement and paths of gravel, tennis courts and wood chips. First of all, the Keeroo is time-saving: you work more efficient. The draw bar is easily adjustable in height so everyone works with a straight back. The Keeroo is an ergonomic product. You pull the Keeroo in a standing position and walk backwards. Your knees, shoulders and back will be less burdened. The Keeroo is indispensable for golf courses and lawns. The sand bed, which serves as a substrate for the turf or the synthetic turf, will be evened easily with this hand grader. The Keeroo seed rake is effective when grass will be sowed. 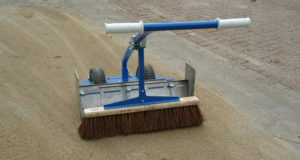 The seed rake can be used to rake in grass seed after sowing. 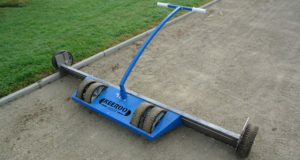 Besides that, the Keeroo seed rake can be used to evenly loosening gravel of the tennis, boules and athletics tracks. Afterwards the Keeroo evens the surface of the tracks.